The members database will be offine for the christmas holidays (December 15-30) for an overhaul and upgrade. Sorry for any inconvenience and hopefully the new database will add a few improvements. If you need to urgently access any of the information in the database please contact me directly. meeting in Villa Carmen, Peru is ready. If you are planning to attend, please fill out our intent to register form. The form will give the organizers a better idea of how many people to expect at the congress. The meeting starts with the ISH symposium, which is held in honor of legendary Bob Wharton, a hymenopterist extraordinaire. Please find the program of the symposium attached. 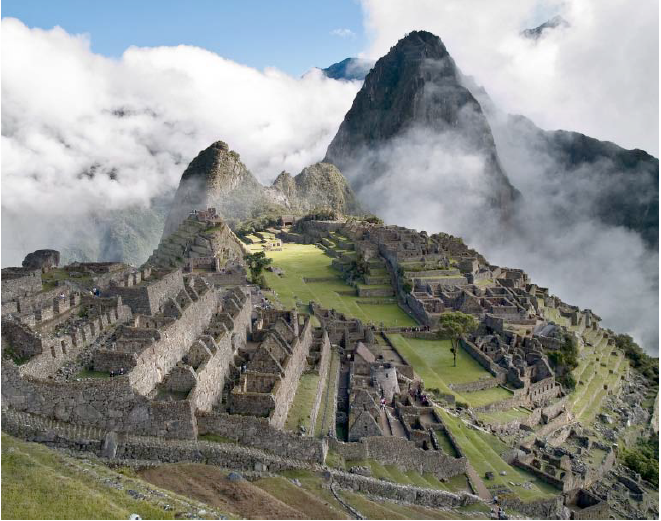 During the business meeting you will hear more about our next year's ISH conference in Cusco and there will be important news and discussions about the future direction of the society. If you have any friends or colleagues that are not ISH members, yet, but who are interested in Hymenoptera please bring them to the meeting as well. Sunday Nov 10th between 12.15 and 1.15pm in front/inside of the Meeting Room 4 ABC, Austin Convention Center 3rd floor (same room where the Hymenoptera session will be from 1.15pm onwards). All students are invited to the inaugural student meet up during the ESA conference in Austin. Please come if you are a student or please forward this message to students in your lab. It will give students an opportunity to get to know each other and to meet their future colleagues. The meeting will be include a small workshop on 'how to make the most of a conference'. 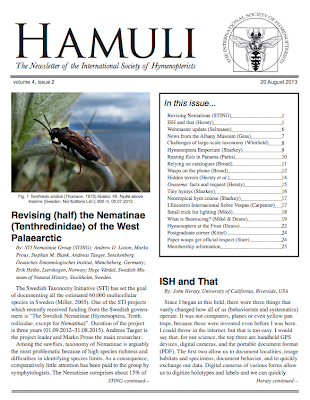 The International Society of Hymenopterists gladly invites hymenopterists from all over the world, to the 8th International Congress of Hymenopterists. 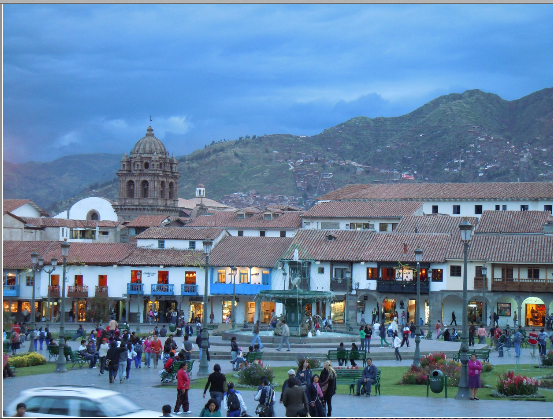 The meeting will be held in Cusco, Peru, 20-25 July 2014. This will be a forum for the dynamic exchange of information and ideas relevant to those interested in Hymenoptera. Your input is required to make this event a success; suggestions for symposia, special sessions and/or keynote speakers will be particularly welcomed. The preliminary program, housing and registration information will be posted on the ISH meeting website sometime in January 2014. But here is the first circular of information to get you excited. The first circular contains many details concerning the meeting, registration, and information about Cusco. Also, we have a flyer for the event. Please download the flyer, print it out, and share it with others in order to promote the meeting. Frank Azorsa: Chair, local Organizing Committee. Centro de Ecologia y Biodiversidad (CEBIO), Lima, Peru. Angelico Asenjo: Local Organizing Committee. Centro de Ecologia y Biodiversidad (CEBIO), Lima, Peru. Eric Yabar: Local Organizing Committee. Universidad Nacional San Antonio Abad de Cusco, Cusco, Peru. John Heraty: ISH President. University of California Riverside, CA, USA. Jim Whitfield: ISH President-Elect. University of Illinois, Urbana, IL, USA. The Distributed European School of Taxonomy (DEST, http://www.taxonomytraining.eu) has launched two types of training courses at various European research facilities and universities. The Modern Taxonomy programme 2013-2014offers intensive theoretical courses in subjects as varied as nomenclature and DNA-barcoding. The Expert-in-training programme 2013-2014 enables graduate students and early career researchers to develop and strengthen their taxonomic research skills through on-the-job-training. PhD students within the Swedish Taxonomy Initiative, the Israel Taxonomy Initiative and the Research School in Biosystematics (ForBio) might receive support to attend DEST-courses. For details, please contact STI, ITI or ForBio. (1) Email Katja Seltmann (enicospilus (at) gmail (dot) com) the image anytime before October 1, 2013. You can enter up to 5 times. (2) Images can be SEMs, cartoons, field images, children in bee costumes, new taxa, old researchers, in situ, paintings, woodcuts, etc. Anything goes as long as it references Hymenoptera or ISH in some meaningful way. (3) Images must include specific information about how to credit the image and the “story” behind the image. 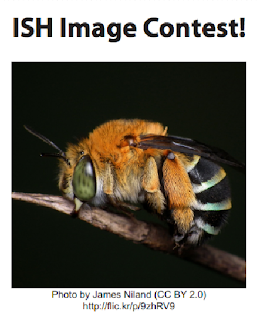 (4) All images must be available for use on the ISH website after the contest. After October 1, 2013 a voting form will be placed on the ISH website and opened to all members. We will announce the voting opportunities via email. Winners will receive free membership for one year, and their image projected and associated story told at this year’s ESA/ISH meeting in Austin, TX. 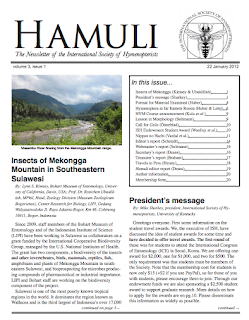 Hamuli vol 4, issue 2 is out! 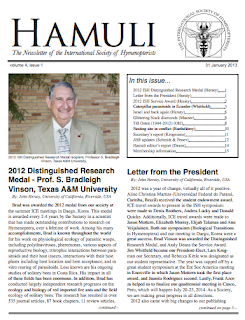 Check out the latest issue of Hamuli! Members should've received a link in their email. 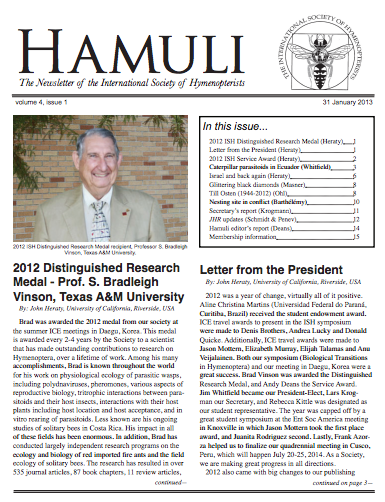 Alternatively one can log into the ISH website and look for links to the latest issue on the members page. Not a member yet? 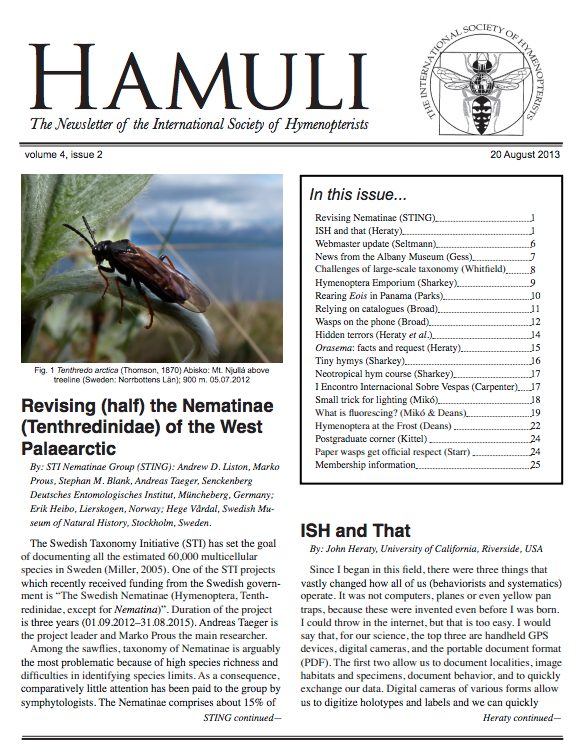 Check out the previous issue of Hamuli (10 MB PDF) and consider joining! Announcing the 2nd Neotropical Hymenoptera Course. It will take place from July 27 to August 6, 2014 at the Villa Carmen Biological Station, Manu Biosphere Reserve, Peru ( Wikipedia Link or United Nations Link ). 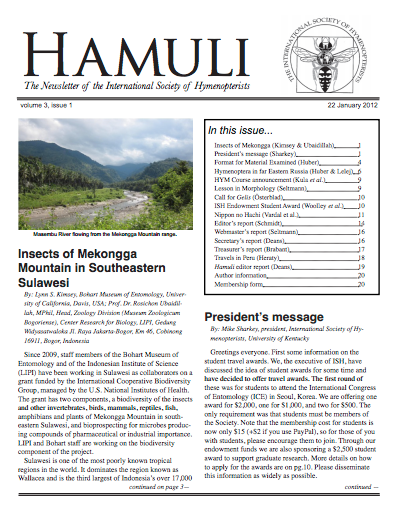 These dates are immediately after the International Society of Hymenopterists Congress (ISH) that will be in Cusco from July 20-25, 2014. There will be transportation from the ISH Congress to the workshop. For more details on the course and how to apply see our website or contact Michael Sharkey, University of Kentucky. International meetings of the ISH take place every four years and planning is underway for our next congress in beautiful Cusco, Peru (July 20-25, 2014). Our contact and organizer this year is Frank Azorsa Salazar. Please get in touch if you have any immediate questions. More information is coming soon and will be made available on our meeting webpage and through the blog. It is time to start making plans now. This is not a meeting to miss! !